to settle his family in TN. in Joe Holt USA Hospital of typhoid pneumonia. Jonathan Vest was the son of James Vest and his second wife, Margaret Canady. 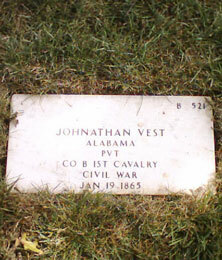 He was the brother of Henry Vest and half-brother of William A. and George W. Vest of the 1st AL Cav. USA and James J. Vest who fought for the Confederacy. Cemetery records state that he died 1/19/1864, originally buried in Soldiers Cemetery, Jeffersonville, IN, reinterred New Albany (IN) National Cemtery, Sec. B, grave 521.